My prayer since before I arrived in Pemba was that the Lord would show me His heart and pour out His Love on me, a double portion. My heart was seeking intimacy with the Lord before I left. I did not know what to expect at Iris. My desire was to just get closer into the presence of the Lord. My first week here I spent playing with children, worshiping with the Mozambiquans, feeding the village children. As I drew closer into His presence, Abba Father drew closer to me too. Holy Spirit taught me how to usher in the presence of the Lord through pure hungered worship. My roommate Sasha and I pray together and His presence comes, Holy Spirit comes, Jesus comes. In ways I have never imagined. Some say there is an open heaven at the base. I beleive there is a hunger at the base that ushers the presence of the Lord right into the midst of our worship. It can be overwhelming here. So much busyness, so many children conditioned to beg, lie and manipulate the visiting missionaries to get things from them. They have been supplied all their needs at the base abundantly and yet the orphan spirit that consumes Africa still abounds in the minds of these little ones. It can harden visitors hearts when they arrive and try to love on all these children that really only care if you give them something and when you don’t they have nothing to do with you. It makes it hard to share the Love of Christ to those who would rather have an ipod. But in it all Christ is so much bigger than the orphan spirit. So my first week I spent seeking direction from the Holy Spirit. I could either be very busy with doing many things with the children I think would be good or I could be guided by Holy Spirit to do the mission I was called here to do. So I waited for my mission and it arrived. 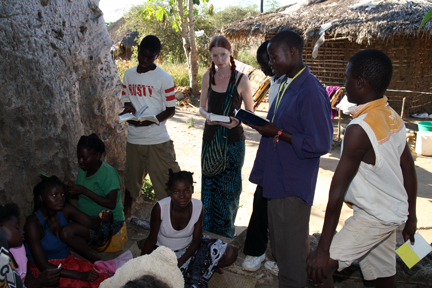 The second Sunday as I prayed Holy Spirit told me to go into the village to minister to the village community. I asked a few of the Village boys that the base uses to translate for the missionaries if they would like to go with Sasha and I to assist us. We managed to gather 5 young men to come along. As we headed into the village Holy Spirit told me to let the young men lead the ministry and Sasha and I should assist them with whatever they needed us to do. I informed the young guys of this and they were very excited. Normally they only translate and pray with the missionaries. Now they were doing the ministry. They took us to all of their families first to pray with them. Then I encouraged them to go door to door. They nervously approached people and began to share with them. I quickly realized that these guys had no clue what they were doing. They did not even know the story of Jesus for themselves. Holy Spirit told me I needed to teach them so I began to show them how to minister from the bible and then I watched as they eagerly wanted to learn more. That day marked the beginning of my mission at the base. The Lord showed me I needed to teach and disciple these young men. They were all saved, water baptised, had a testimony and been conditioned to be prayer warriors, but now it was time they had an intimate encounter with their Father. It is very taboo for single women to minister to young men in Africa. Especially in Mozambique where sexual things are taught to children as young as 4 and encouraged throughout their youth. It is a very permiscuous society. I was a bit hesitant when Holy Spirit said we should teach these young men. It could cause the wrong message to get passed along amongst them and the message of Christ could be missed entirely. But Holy Spirit told me if I trusted the Lord, He would stand in the gap and communicate the true heart of the Lord. So in faith I stepped out into the unknown. Holy Spirit gave me the first bible lesson and kept speaking to me that they would be the ones to lead the study. All I knew was I needed to be there to organize it. Sasha and I told the guys that came with us to the village that we would have a bible study for them and their friends if they were interested. Monday was our first night, 5pm (or in Africa time 5:41pm). Eight guys showed up anxious to learn and only two had a bible. Sasha and I wrote down their names and thus started our mission to get each one of them a bible even though we were told there were none to be purchased in Pemba due to a shortage. Reading your thoughts and experiences is so incredible. Your heart for the Lord is such a beautiful thing to witness. As you pray for the leading of the Holy Spirit in Africa I am re-inspired to draw closer to the Lord. You are not just serving the Lord in Africa but also in the U.S.A. at this very moment. I am touched by your words and prayers on a level I cannot even begin to describe. They make me thirsty for His living water.